Photo by Jenn Burt. Also visible, in the centre of the photo, is an opalescent nudibranch (Hermisseda crassicornis). This pale orange (sometimes almost white) compound tunicate grows in groups of many small, thin, and rounded but irregularly-shaped colonies measuring up to 12.5 cm across (may be long and narrow). These colonies are dotted with many small holes and a few larger openings (cloacal apertures). Some of the structure of these colonies comes from microscopic spiky spicules. Pacific white crust, a common species in kelp forest habitats, grows on rocks in the intertidal and subtidal to 30 m deep. Its recorded range extends from the Central Coast of BC to Panama. 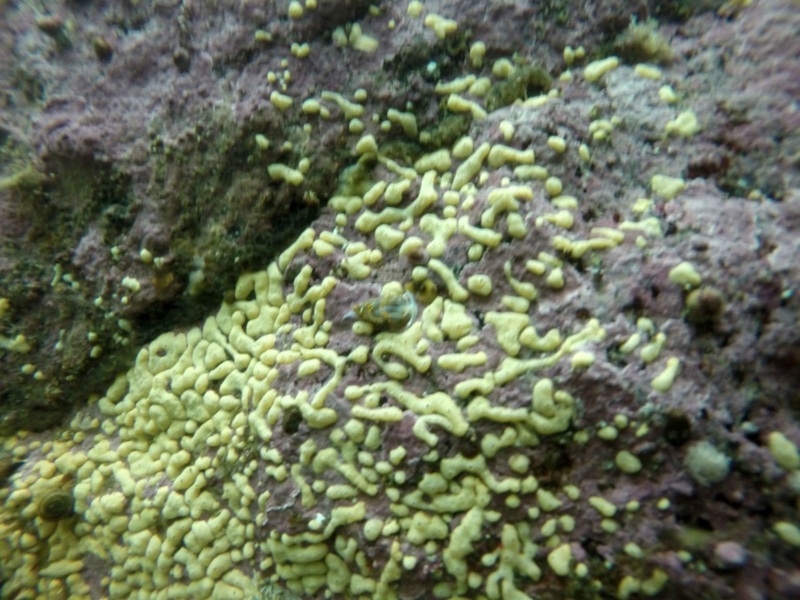 Similar-looking compound tunicates, such as Trididemnum opacum and other Didemnum species, grow in more continuous colonies. The former also has fewer large openings and is commonly a greyish or brownish colour. Watanabe, J. M. (2011). Phylum Chordata, Subph. Urochordata: Subtidal Tunicates. SeaNet: Common Marine Organisms of Monterey Bay, California. Stanford University, Stanford, CA. Accessed 01/12/2015.